Much has been said of the impact of radio friendly stadium rock in this blg series and surely no act represents the mass appeal of it on music fans as Journey. Big chords, big hooks, big guitar solos and even bigger hair, it’s no surprise why their Greatest Hits has become such a huge seller. What’s most interesting is the longevity, this is an album that has 520(!!) weeks on the Billboard 200, where it still sits at number 68 as of the week of writing. The album has never made it higher than number 10 in the US, while none of the songs featured have hit #1. It’s not an album of immediate chart hits, but so many of the songs featured here have become era defining radio hits in the decades that have followed. Of course none more-so than Don’t Stop Believin’ which thanks to a series of high profile uses one the likes of Glee and X Factor became one of the biggest selling hits of the current decade. Everything is distinctively 80s, from the opening keyboard heard on Send Her My Love, to the reverb heard on Steve Perry’s voice on Who’s Crying Now, but there’s a timeless quality to all of the songs too. Be Good To Yourself is full of poppy energy, which is a theme that permeates much of the songs here. Journey are hardly trying to be cool on anything here and the unabashed joy that they exude of tracks like this and Any Way You Want It is infectious and genuinely admirable. Of course there are more dramatic moments, such as the epic Separate Ways (Worlds Apart) or one of the biggest hits here Open Arms that features Steve Perry’s best vocal performance here. In fact that voice is by far the best thing about Greatest Hits as a listen, Perry is a tremendous vocalist and delivers every song here with punchy energy and a soaring tone. It’s why I’d be much more likely to be drawn to Journey over similar bands of the era like Bon Jovi, Starship or even Boston; ‘The Voice’ is undeniable. 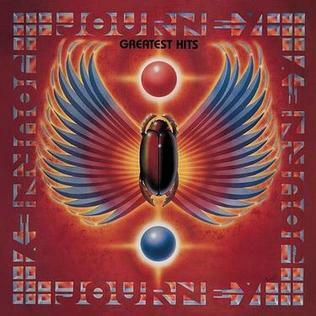 Greatest Hits may have been a slight overstatement for the size of these hits at the time of release, but there’s no other album that has delivered so consistently for so many years after release like this has for Journey. Will I listen again? : Maybe, but I’ll probably just add a few choice cuts to my music library. Best Track: Separate Ways (Worlds Apart) really stood out for me here, it’s a huge sounding record that pushes Perry’s vocals to the limit. Tags: Any Way You Want It, Don't Stop Believin', Greatest Hits, Journey, Open Arms, The World's Greatest Hits. Bookmark the permalink.